Adidas’s Group Executive Member Eric Liedtke and the Parley for the Oceans founder Cyrill Gutsch during their talk “Oceans. Climate. Life” discussed the problem of cleaning up the world ocean from post-consumer plastic waste. “At Parley for the Oceans, we want to establish the oceans as a fundamental part of the debate around climate change. Our objective is to boost public awareness and to inspire new collaborations that can contribute to protecting and preserving the oceans,” said Gutsch who gathered together all kinds of creatives—artists, journalists, environmental activists, etc.— for this purpose. 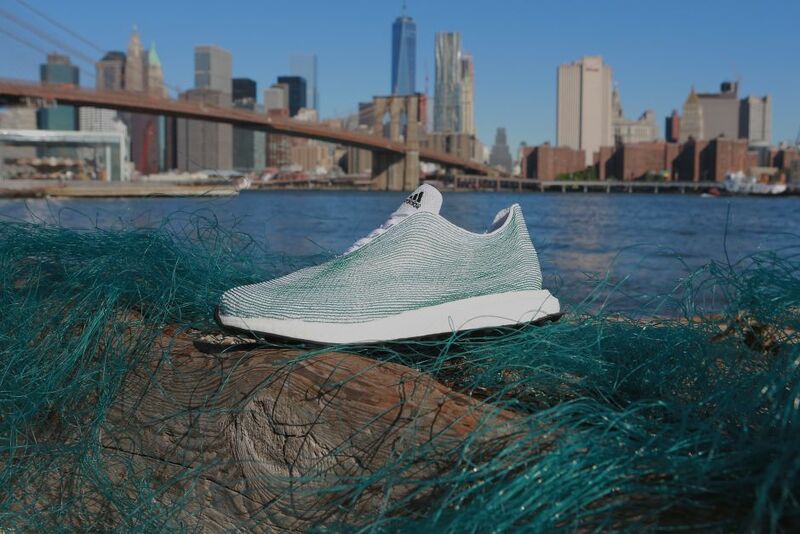 The new adidas sneakers feature an upper made of yarns sewed from the recycled deep-sea plastic and the sole made of other sustainable materials. Last year, the Dutch fashion and lifestyle brand G-Star RAW created the line of denim Raw for the Oceans made with the same idea behind—to clean up and protect the oceans. Posted in Design, Sustainability and tagged Adidas, clothing & footwear, recycling, sustainability. Bookmark the permalink.